Let me start by giving you some background information. Our backyard backs up to a farm and we have a chain link fence around our backyard. Along the backside of our yard our fence runs parallel to the farm’s barbed wire fence. There is about a foot and a half of space between the two. 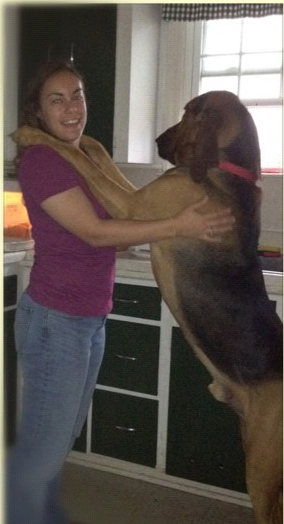 Hank (our biggest dog) has been trying to figure out how to get the chickens since the day we got them. Once they moved outside to the coop we had to take various steps to keep him out, such as using chain link around the chicken run area and burying chicken wire in the ground around it. Yesterday Hank and Scout (our Bloodhound puppy) were out in the backyard. When I looked out the window to check on them I realized Hank was out in the field behind our house, beyond the barbed wire fence. I immediately ran outside and found that he had dug under the chain link fence and had gone under or through the barbed wire fence. I have no idea whether he went out there because there was a cat in the field (there often is) or if it was some new attempt at getting the chickens. I’m guessing the latter. Either way I had to get him back in our yard. He weighs 125 pounds so just picking him up and putting him back in our yard was not a possibility. The cut on the upper part of my calf is pretty deep. I also ended up with two other cuts on the outside of my thigh. 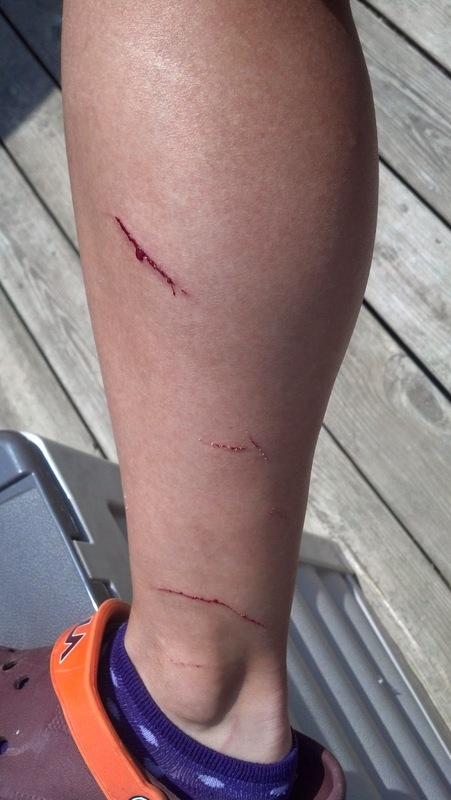 Lesson of the day: Don’t mess with barbed wire, it bites back. Or if you do have to mess with it, wear something other than shorts! What lesson of the day do you have to share? Share a piece of wisdom with me you have gathered over the years. If you get deodorant on your clothes, you can rub it off with a balled up sock. When you realize that all seasons of The Closer have become available for free for Amazon Prime members, your productivity for the day will decrease DRAMATICALLY. When the mid-summer zucchini monster hits, you can shred the stuff into tuna or egg salad. It keeps the salad super moist, you get extra veggies, and you don’t taste A THING. Ouch!! Hope you’ve had a tetanus shot lately; if not, get one! Glad you caught your crazy pup. I still have a scary on my leg from a barbed wire/pony incident. Oh no, that cut looks nasty. I’m happy for you that the barbed wire fence wasn’t electric! That would have been awful! 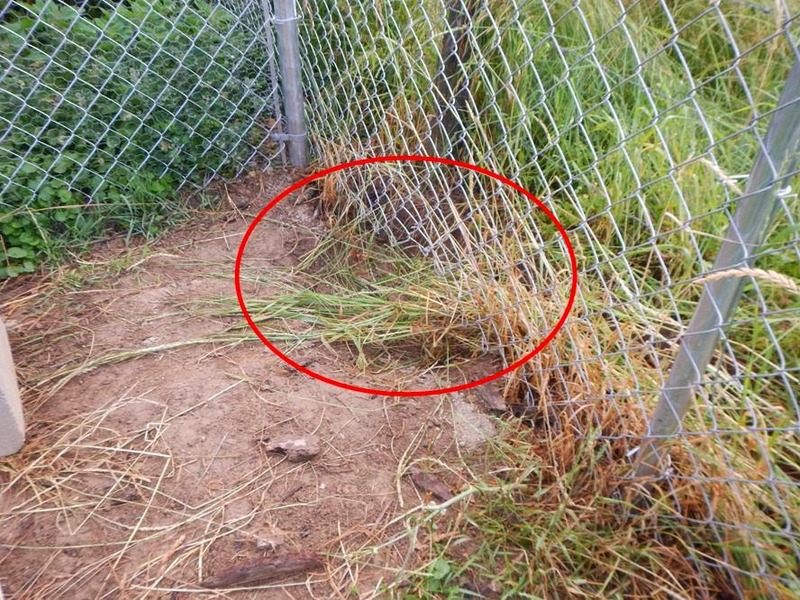 Do you think Hank will be able to dig under the fence to get to the chickens even though you buried it? Is he just curious about the chickens or do you think he would hurt them? Good luck! I’m really glad it wasn’t an electric fence and that they don’t have a hot wire! That definitely would have complicated the situation. He shouldn’t be able to dig under where we buried the chicken wire, but we didn’t bury it on the backside. I doubt he could get in back there because he would have to dig while being in that foot and a half space between our fence and the barbed wire. He was really freaked out being in that space (I could see the whites in his eyes) so I doubt he’d spend much time in there- even for chickens. And yes, I wholeheartedly believe he would eat them if he did get to them. I’m glad I didn’t need stitches, too. It’s healing up now and it looks like it’s going to leave a lovely raised scar :-/ no good.